Loyola’s School of Mass Communication upholds a longstanding tradition of excellence and innovation in preparing its students for lucrative careers. From our humble beginnings—including WWL Radio Station originally located in Marquette Hall—our faculty and staff members have displayed expertise and dedication in their respective fields. Award-winning journalist and professor S.L. 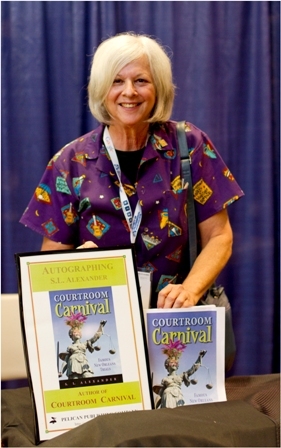 Alexander, Ph.D., has maintained this tradition both in and out of the classroom with the release of her newest book, Courtroom Carnival: Famous New Orleans Trials. Courtroom Carnival features the stories of 10 high-profile trials rooted in the city. The stories covered the trials of famed litigants Senator Michael O’Keefe, “Fop Cop” Antoine Saacks, “Chicken Man” Al Copeland, and many more. “I had been asked to write about the 2000 corruption trial of Gov. Edwin Edwards for a judges’ journal, a law journal, and a journalism journal. A lot of people said, ‘Well, why don’t you write about it for everybody?’ So I said okay, I will,” Alexander says. Alexander began the writing process before Hurricane Katrina, but the book itself is the result of years of research. Chapter 11, “The Wit and Wisdom of Edwin Edwards,” stems from 10 years of correspondence and features 100 amusing quotes from his time in the public eye. These contributing authors were Charles Zewe, M.A. ’03, Ph.D.; Glenn Watts, Ph.D., Esq; Lyn Koppel, M.A. ; Jennifer John Block, M.A. ’07; and Erin Bremer ’06. Their contributions were to the trials of Al Copeland (Zewe), Harry Connick, Sr. (Watts), Darlene Jacobs (Koppel), Harry Lee (Block), and Sherman Copelin (Bremer). While in the midst of a successful book tour, Alexander taught an honors course titled Courtroom Carnival: Tales of New Orleans Courtrooms. 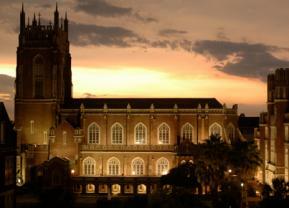 Offered during the fall 2011 semester, the course introduced many out-of-state students to the New Orleans court system. Alexander has made a priority of conveying the importance of courtroom coverage by the media. A veteran in the field, she has brought her life’s work—a fusion of print, television, radio, consulting, and public speaking—to the classroom. We can be certain that there are many more great things in store for her career and her students. Carlyn Worthy ’12 (communication) worked as the publications intern for the Office of Marketing and Communications.